Back in June, we highlighted an awkward television exchange in which Vermont Sen. Bernie Sanders really, really didn't want to answer questions from CNN anchor Erin Burnett about a federal bank fraud investigation targeting his wife -- and in which he himself was also implicated. It wasn't the first time the Socialist lawmaker got testy on the subject, which he's cynically tried to dismiss as a "pathetic attack" that was "launched by" a Trump supporter against his wife. As explained at the time, this FBI probe into financial misconduct was actually kicked off by the Justice Department during the Obama era, and Jane Sanders -- a grown adult and active political figure in Bernie's orbit -- isn't above criticism for alleged criminal acts. 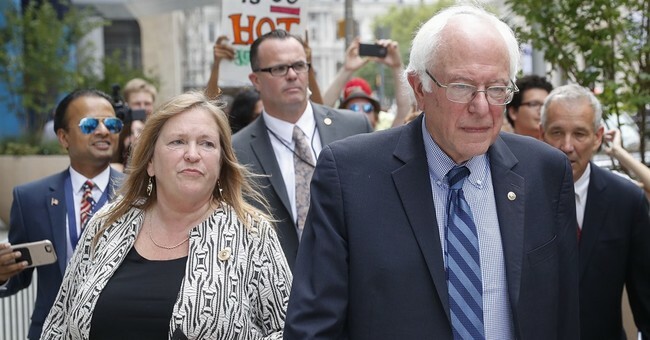 The federal probe into a 2010 land deal orchestrated by former Burlington College president Jane Sanders, wife of U.S. Sen. Bernie Sanders, I-Vt., has deepened. VTDigger has confirmed that a grand jury has compelled sworn witness testimony in the case. The Vermont U.S. Attorney’s office has interviewed at least one witness before the grand jury to determine whether indictments should be handed down. Former Burlington College board member Robin Lloyd says she testified for about an hour on Oct. 26 before a grand jury at the federal courthouse in Burlington. Paul Van de Graaf, chief of the criminal division for the U.S. attorney’s office in Vermont, questioned Lloyd about her role as the development chair of the college’s board of trustees during a period when Sanders was collecting donations and pledges for the purchase of a $10 million city lakefront property. Lloyd, who is publisher of the progressive website Toward Freedom, kept copious board meeting minutes as the development chair for the college. In the interview with Van de Graaf, Lloyd said he “was focused on what I knew about who had been approached for contributions.”...Lloyd’s appearance is the first public confirmation that the federal government has compelled a grand jury. A Sanders spokesperson quoted in the local report says there's less to these developments than meet the eye: “We have absolutely no reason to believe that there is a grand jury empaneled to examine Burlington College, Jane Sanders, or any aspect of Dr. Sanders’ service as president of Burlington College," former campaign flack Jeff Weaver told VTDigger.com. "As best we can tell, the current news reports are simply recycling an account of a government interview of a witness from several months ago. Nothing new here.” Except now we know that a federal grand jury was convened to compel testimony from a witness regarding the process by which contributions to the failed college were solicited -- a relevant element of the case. By the way, in case you missed it, Sanders admitted that 91 percent of middle class Americans will get a tax cut under the newly-passed GOP law, which he'd called a "massive attack" on middle income earners. He's insisting that those tax rates be extended permanently. I agree.